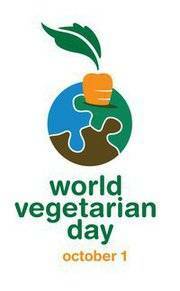 World Vegetarian Day is observed annually on October 1. It is a day of celebration established by the North American Vegetarian Society in 1977 and endorsed by the International Vegetarian Union in 1978, to promote the joy, compassion and life-enhancing possibilities of vegetarianism. It raises awareness of the ethical, environmental, health and humanitarian benefits of a vegetarian lifestyle. World Vegetarian Day initiates the month of October as Vegetarian Awareness Month, which ends on November 1, World Vegan Day, as the end of that month of celebration. Vegetarian Awareness Month has been known variously as Reverence for Life month, Month of Vegetarian Food, and more.